Mr Speaker the 15th of March will now forever be a day etched in our collective memories. On a quiet Friday afternoon a man stormed into a place of peaceful worship and took away the lives of 50 people. That quiet Friday afternoon has become our darkest of days. But for the families, it was more than that. It was the day that the simple act of prayer – of practising their Muslim faith and religion – led to the loss of their loved ones lives. Those loved ones, were brothers, daughters, fathers and children. They were New Zealanders. They are us. And because they are us, we, as a nation, we mourn them. We feel a huge duty of care to them. And Mr Speaker, we have so much we feel the need to say and to do. One of the roles I never anticipated having, and hoped never to have, is to voice the grief of a nation. At this time, it has been second only to securing the care of those affected, and the safety of everyone. And in this role, I wanted to speak directly to the families. We cannot know your grief, but we can walk with you at every stage. We can. And we will, surround you with aroha, manaakitanga and all that makes us, us. Our hearts are heavy but our spirit is strong. Mr Speaker, 6 minutes after a 111 call was placed alerting the police to the shootings at Al-Noor mosque, police were on the scene. The arrest itself was nothing short of an act of bravery. Two country police officers rammed the vehicle from which the offender was still shooting. They pulled open his car door, when there were explosives inside, and pulled him out. I know we all wish to acknowledge that their acts put the safety of New Zealanders above their own, and we thank them. But they were not the only ones who showed extraordinary courage. Naeem Rashid, originally from Pakistan, died after rushing at the terrorist and trying to wrestle the gun from him. He lost his life trying to save those who were worshipping alongside him. Abdul Aziz, originally from Afghanistan, confronted and faced down the armed terrorist after grabbing the nearest thing to hand – a simple eftpos machine. He risked his life and no doubt saved many with his selfless bravery. There will be countless stories, some of which we may never know, but to each, we acknowledge you in this place, in this House. For many of us the first sign of the scale of this terrorist attack was the images of ambulance staff transporting victims to Christchurch hospital. To the first responders, the ambulance staff and the health professionals who have assisted – and who continue to assist those who have been injured. Please accept the heartfelt thanks of us all. I saw first-hand your care and your professionalism in the face of extraordinary challenges. We are proud of your work, and incredibly grateful for it. Mr Speaker, if you’ll allow, I’d like to talk about some of the immediate measures currently in place especially to ensure the safety of our Muslim community, and more broadly the safety of everyone. As a nation, we do remain on high alert. While there isn’t a specific threat at present, we are maintaining vigilance. Unfortunately, we have seen in countries that know the horrors of terrorism more than us, there is a pattern of increased tension and actions over the weeks that follow that means we do need to ensure that vigilance is maintained. There is an additional and ongoing security presence in Christchurch, and as the police have indicated, there will continue to be a police presence at mosques around the country while their doors are open. When they are closed, police will be in the vicinity. There is a huge focus on ensuring the needs of families are met. That has to be our priority. A community welfare centre has been set up near the hospital in Christchurch to make sure people know how to access support. Visas for family members overseas are being prioritised so that they can attend funerals. Funeral costs are covered, and we have moved quickly to ensure that this includes repatriation costs for any family members who would like to move their loved ones away from New Zealand. We are working to provide mental health and social support. The 1737 number yesterday received roughly 600 texts or phonecalls. They are on average lasting around 40 minutes, and I encourage anyone in need to reach out and use these services. They are there for you. Our language service has also provided support from more than 5000 contacts, ensuring whether you are ACC or MSD, you are able to pass on the support that is needed, in the language that is needed. To all those working within this service, we say thank you. Our security and intelligence services are receiving a range of additional information. As has been the case in the past, these are being taken extremely seriously, and they are being followed up. I know though Mr Speaker, that there have rightly been questions around how this could have happened here. In a place that prides itself on being open, peaceful, diverse. And there is anger that it has happened here. There are many questions that need to be answered, and the assurance that I give you is that they will be. Yesterday Cabinet agreed that an inquiry, one that looks into the events that led up to the attack on 15 March, will occur. We will examine what we did know, could have known, or should have known. We cannot allow this to happen again. Part of ensuring the safety of New Zealanders must include a frank examination of our gun laws. As I have already said Mr Speaker, our gun laws will change. Cabinet met yesterday and made in-principle decisions, 72 hours after the attack. Before we meet again next Monday, these decisions will be announced. 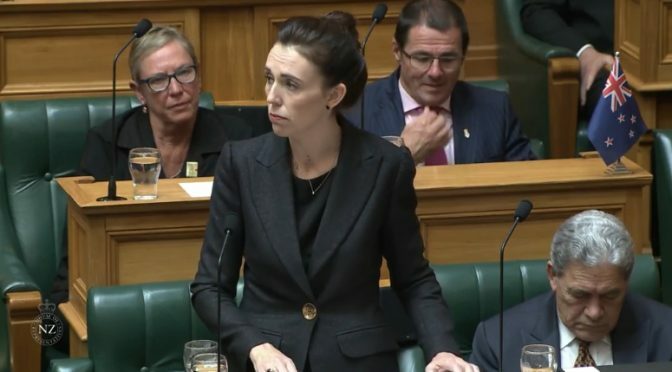 Mr Speaker, there is one person at the centre of this act of terror against our Muslim community in New Zealand. A 28-year-old man – an Australian citizen – has been charged with one count of murder. Other charges will follow. He will face the full force of the law in New Zealand. The families of the fallen will have justice. He sought many things from his act of terror, but one was notoriety. And that is why you will never hear me mention his name. He is a terrorist. He is a criminal. He is an extremist. But he will, when I speak, be nameless. And to others I implore you: speak the names of those who were lost, rather than name of the man who took them. He may have sought notoriety, but we in New Zealand will give him nothing. Not even his name. Mr Speaker, we will also look at the role social media played and what steps we can take, including on the international stage, and in unison with our partners. There is no question that ideas and language of division and hate have existed for decades, but their form of distribution, the tools of organisation, they are new. We cannot simply sit back and accept that these platforms just exist and that what is said on them is not the responsibility of the place where they are published. They are the publisher. Not just the postman. There cannot be a case of all profit no responsibility. This of course doesn’t take away the responsibility we too must show as a nation, to confront racism, violence and extremism. I don’t have all of the answers now, but we must collectively find them. And we must act. As I conclude I acknowledge there are many stories that will have struck all of us since the 15th of March. One I wish to mention, is that of Hati Mohemmed Daoud Nabi. He was the 71-year-old man who opened the door at the Al-Noor mosque and uttered the words ‘Hello brother, welcome’. His final words. Of course he had no idea of the hate that sat behind the door, but his welcome tells us so much – that he was a member of a faith that welcomed all its members, that showed openness, and care.I have said many times Mr Speaker, we are a nation of 200 ethnicities, 160 languages. We open our doors to others and say welcome. And the only thing that must change after the events of Friday, is that this same door must close on all of those who espouse hate and fear. Yes the person who committed these acts was not from here. He was not raised here. He did not find his ideology here, but that is not to say that those very same views do not live here. I know that as a nation, we wish to provide every comfort we can to our Muslim community in this darkest of times. And we are. The mountain of flowers around the country that lie at the doors of mosques, the spontaneous song outside the gates. These are ways of expressing an outpouring of love and empathy. But we wish to do more. We wish for every member of our communities to also feel safe. Safety means being free from the fear of violence. But it also means being free from the fear of those sentiments of racism and hate, that create a place where violence can flourish. And every single one of us has the power to change that. Mr Speaker on Friday it will be a week since the attack. Members of the Muslim community will gather for worship on that day. Let us acknowledge their grief as they do. Let’s support them as they gather again for worship. We are one, they are us. pace su di voi. E pace su tutti noi. Abbiamo aumentato la presenza delle forze di sicurezza, ancora in corso a Christchurch, e come indicato dalla polizia, continuerà a esserci presenza di polizia nelle moschee in tutto il paese mentre le loro porte sono aperte. Quando saranno chiuse, la polizia resterà nelle vicinanze. C’è un’enorme attenzione nel garantire che i bisogni delle famiglie vengano soddisfatti. Questa deve essere la nostra priorità. È stato allestito un centro di assistenza sociale vicino all’ospedale di Christchurch per assicurarsi che le persone sappiano dove rivolgersi. I visti per i familiari all’estero sono una priorità in modo che possano partecipare ai funerali. I costi funerari sono coperti e ci siamo mossi rapidamente per garantire che siano inclusi i costi di rimpatrio per i familiari che vorrebbero portare i loro cari via dalla Nuova Zelanda. Stiamo lavorando per fornire assistenza psicologica e sociale. Il numero 1737 ha ricevuto circa 600 messaggi o telefonate. In media durano circa 40 minuti e incoraggio chiunque abbia bisogno di contattare e utilizzare questi servizi. Sono lì per voi. Abbiamo anche previsto un servizio di traduzione per tutti quelli che ne avranno bisogno: a chi lavora a questo centro, grazie. I nostri servizi di intelligence stanno raccogliendo informazioni aggiuntive. Come in passato, le stiamo prendendo in grande considerazione. So, signor presidente, che ci sono stati molti e giusti interrogativi sul perché questo attacco sia stato fatto proprio qui, in un luogo che è orgoglioso del suo essere aperto, pacifico e vario. C’è rabbia per il fatto che è accaduto qui. Ci sono molte domande che ancora devono trovare risposta e posso assicurarvelo: daremo le risposte. Ieri il governo ha deciso di aprire un’inchiesta sui fatti che hanno portato al 15 marzo. Analizzeramo quello che sapevamo, quello che avremmo dovuto sapere e quello che avremmo potuto sapere. Non possiamo permettere che accada di nuovo.